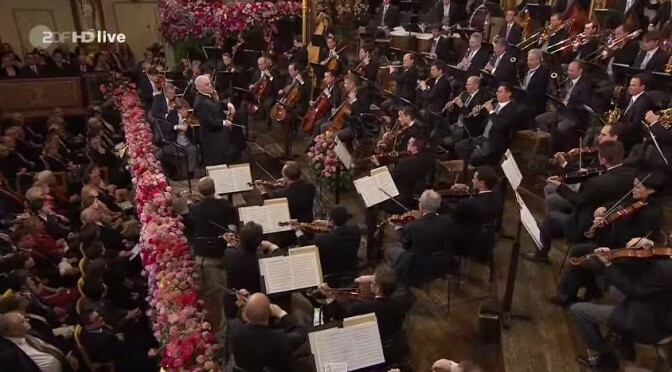 Wiener Philharmoniker’s (Vienna Philharmonic Orchestra) New Year’s Concert 2014, conductor: Daniel Barenboim. The New Year’s Concert of the Vienna Philharmonic is a concert of classical music that takes place each year in the morning of New Year’s Day in Vienna, Austria. As of 2012, it is broadcast around the world to an estimated audience of 50 million in 73 countries. 1:29:08 Vielliebchen, Polka française, op. 1 – Joseph Hellmesberger d.j.